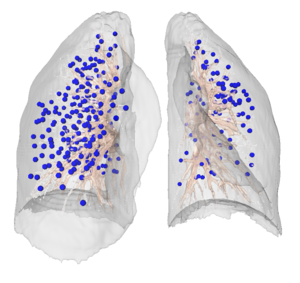 Transparent 3D lung rendering with automatically detected point features (blue) which are used as additional constraints in the registration. Overlay of two masked lung images before (left) and after (right) 3D image registration. Lung boundaries as well as vessels are aligned very well. 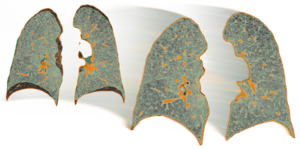 In this project a variational approach for lung registration is supported by the usage of automatically detected point features. An accurate registration is a versatile tool for various important applications: Breathing motion compensation in radiation therapy, improved follow-up analysis in e.g. oncology and quantitative volume change analysis for COPD (chronic obstructive pulmonary disease). The focus is on CT scans but the algorithmic concepts can also be extended to multimodal registration tasks. T. Polzin, Lung Registration using Automatically Detected Landmarks, Workshop on Biomedical Image and Signal Computing (BISC 2013), 58. Jahrestagung der Deutschen Gesellschaft für Medizinische Informatik, Biometrie und Epidemiologie (GMDS) e. V.